If you have your own pool, you are one of the lucky ones. Swimming pool maintenance doesn't have to be difficult, but knowing how to properly maintain your pool will make it last longer and be a safer place for family fun. Allowing pH to get above 8.0. At 8.5 chlorine is only 10% active. At 7.0 it is about 73% active. By just maintaining pH around 7.5 the chlorine is 50-60% active. Not keeping alkalinity between 80-140 PPM. Low or high alkalinity can affect water balance and ultimately a sanitizer's abilty to perform. Not checking TDS (Total Dissolved Solids) or calcium hardness on a regular basis. Check TDS every 6 months and calcium hardness every month. These also affect water balance which is different from sanitation, althought related. Backwashing sand or DE filters too often. If you do this, the filter can never reach its cleaning potential. If you backwash on a regular basis for no reason, you are wasting water. Most filters require backwashing when the pressure guage rises 8-10 PSI from clean. Not brushing the walls and tile down often enough. If your circulation system is suspect, and may are, brushing down the walls will help eliminate algae problems. Keeping your pool clean will save you money. Not running pumps long enough. You should run your pump about 1 hour for every 10 degrees of temperature. This assumes you have a decent ciculation system. It is ALL about the FLOW! 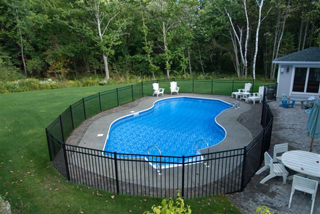 Circulation IS the key to a low maintenance swimming pool. Not replacing missing or broken drains or suction sources. This is a real and dangerous hazard. The same could be said for defective door/gate closers and fences in disrepair. Not purchasing high quality pool chemicals with the proper concentrations for your pool.